The IV group investigates and developes state-of-the-art techniques for vehicle perception, and modeling the vehicle’s environment, containing static infrastructure and dynamic objects. Important classes of dynamic objects are pedestrians and (motor)cyclists, the so called Vulnerable Road Users (VRUs), but of course other vehicles, buses, trams and trucks are detected and tracked too. Perception of the environment can be done with a multitude of sensors, including radar, lidar, and cameras. 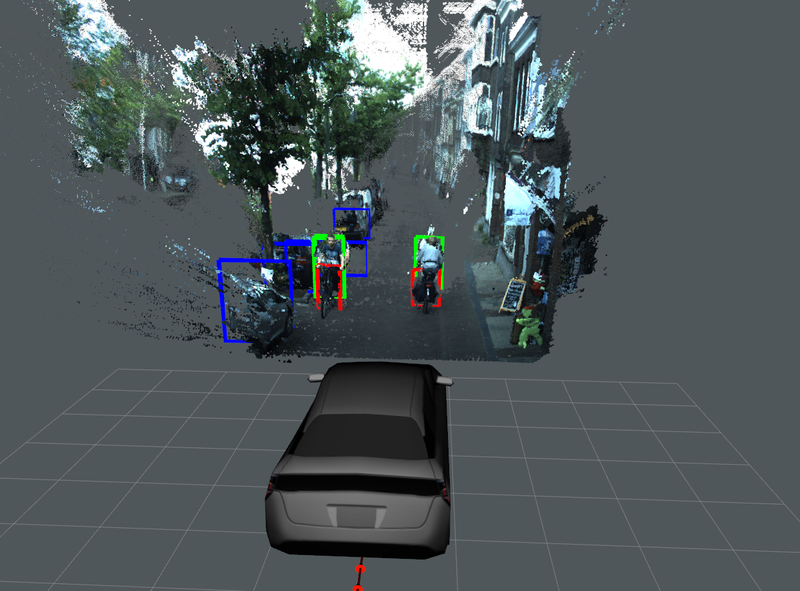 Our group’s demonstrator vehicle for instance utilizes a stereo-camera setup to create a 3D representation of the environment, and detect its occupants, as seen in the image on the right. By understanding where objects are around us, and what kind of objects these are, an intelligent vehicle can also predict future traffic situations, and assess the risks and benefits of different manouvres. Modeling behavior of traffic participants is therefore an important research topic in our group. Kooij, J. F. P., Schneider, N., Flohr, F., & Gavrila, D. M. (2014, September). Context-based pedestrian path prediction. In European Conference on Computer Vision (pp. 618-633). Springer.